I am Emperor Morgan the Wise of Alba. King of Scotland, Ireland, and England. The last heir to the Kingdom of Aquitaine and de jure liege of Wales and Brittany. Duke of Albany and the Dunbar ancestral lands Lothian, and Count of all associated holdings. You may remember my great, great, great grandmother: AElfeda who married matrilineally to Patrick which her brother put on the throne. King Patrick only lived for another decade or so and when he died the realm passed to the first Dunbar king: King Dietrich. AElfeda lived to a ripe old age of 69. In those years as Queen Mother and Duchess of Lothian, the Dunbar ancestral lands, King Dietrich broke away from the generational plan to start moving into the English nobility and instead pushed into Ireland. His second-cousin was a Countess by the name of Godgifu, a formidable woman who would come to be known as “the Lion” and had many claims in Ireland. Dietrich pushed those claims and by the time Queen AElfeda died and the ancestral lands passed to him, Northern Ireland was within Scottish borders. This of course made the Countess quite powerful. In fact, by doing this she was probably one of the most powerful people in Scotland. She was the Countess of Galloway, Ulster, Oriel, and Tyrone. More worryingly, though, she was sworn to the Duke of Moray. Duke Lachlan. An ambitious a Muirebe. Uprisings, both from nobility and peasantry, happened from time to time but it was a wise King that kept enough territory in his demense and enough allies to be able to handle any opposition. Between the Duke of Moray and the Countess they could perhaps match the King’s personal levies – and that was a problem. Transferring the vassalage of the Countess directly to the King would be out of the question – the Duke would surely rise up in arms and the Countess would be obligated to join him. So Dietrich simply promoted the Countess to the Duchess of Ulster. A newly created Duchy for the new Irish holdings. By making her a peer of Moray she could no longer be his vassal and, like all dukes, swore fealty directly to the king. Dietrich was known as the Careless because he was often wounded in battle. Ultimately he took a blow to the head answering a call to arms to a distant ally – the King of Aquitaine (some sort of marriage alliance no doubt) – and was rendered incapable. A regent ruled for a few years and then Scotland, and the ancestral Lothian lands, passed to Dugald in the year of our Lord, 1175. Each successive King achieved more than the last. Dietrich was known for bringing northern Ireland into the fold. Dugald would all-but complete his father’s quest. On succession Dugald began claiming Irish territory on behalf of his vassals. You see, Ireland was not a united Kingdom but broken up into smaller Petty Kingdoms – sometimes only one county in size. This made them grossly outnumbered as they rarely banded together. By picking the Irish apart, Dugald incorporated just under half of Irish land. More importantly though, the once loyal Countess turned on the new King. She loved his father, of course, but held no special love for Dugald and, as previously stated, she was one of the most powerful individuals in Scotland. The inevitable eventually occurred and she rose up in rebellion demanding independence. It was a tough war, but the King was rich and hired mercenaries to defeat her armies and imprison the Countess. She was stripped of her Ducal title and Dugald passed it to a more loyal vassal. She never saw the light of day again and eventually died in the King’s dungeons around 1185. She would serve her King one last time though, just before her death. After some investigation it was discovered she had one more claim that could be pressed: Dublin. Dugald pushed the claim – dungeon’s were not known for keeping their guests healthy and Dublin needed to be claimed before she, unfortunately, expired. It was swiftly done, and within 12 months the Countess passed on. Now with over half of the Irish counties under Scottish rule, Dugald declared himself King of Ireland. This gave him an all-too-important casus belli on any remaining Irish counts and Petty Kings – your lands are now rightfully within the realm of the King. Due to the intricacies of peace treaties the entirety of Ireland was not quite incorporated before Dugald’s death in 1199 – the County of Desmond remained, the last refuge of King Mael-Sechlann of Munster – protected by a 10-year truce. King Dugald, aged 64, was known as “the Old” when he passed the ancestral lands of Lothian on to his son Waldeve. My Grandfather. Waldeve’s reign was inconceivably long. But also very successful. With Dugald’s death, so did die his truce with King Mael-Sechlann, and Waldeve incorporated the last Irish hold-out into his realm. Next he moved on the Petty Kings of Wales. The idea was with the Irish and Welsh combined with Scottish levies, he should have enough men to place anyone he needed on the English throne. Or, perhaps, to claim counties one-by-one should opportunities arise. He didn’t have to wait long. England was regularly breaking down into civil war, and in 1208 a succession crisis lead to England splitting in two. As it happens, Waldeve had a woman in his court by the name of Valdrade who had a weak claim on the throne. In fact there was also a woman by the name of Herrmessent who also had a claim. Valdrade was Countess of Ross, and Herrmessent was Duchess of The Isles. Waldeve carefully weighed up both options – most importantly where their children lay in the line of succession, and their ages in comparison to Waldeve’s – and determined Valdrade the better claimant. This would be quite a different story for me, if he had chosen otherwise. Valdrade, supported by Waldeve, threw her hat into the conflict over the English throne (at that time seated by the child-Queen Constance.) The war ended in 1213 with Valdrade on the throne. The Duke died young to some disease. This freed up Eleanor to marry again and Valdrade’s son was not quite of age, but Eleanor was only in her mid-twenties and still of a child-bearing age. No doubt a virile 16-year-old would be able to get her to bear a son. And so it came to be. Waldeve married his brightest and youngest daughter, Eleanor, to Valdrade’s son and heir, Guirand – my mother and my father. Still, the laws in Scotland meant that Waldeve’s rightful heir was his nephew, as he had no sons of his own. The succession laws were changed to elective. 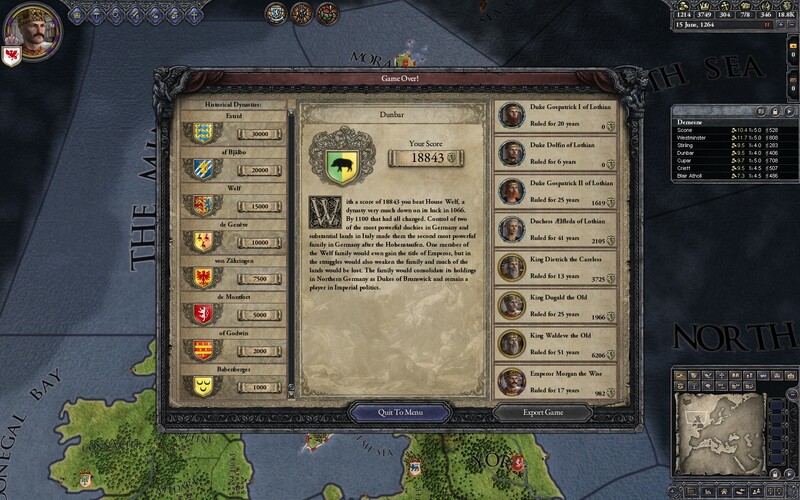 This allowed all of Waldeve’s dukes to vote on the next king, but they rarely stray from the King’s suggestion and so when I was born in 1221 he immediately nominated me, his grandson. Perhaps to cover his bases, when Waldeve’s wife died in 1211 he married a very young Mael-Muire. She then went on to bear him another daughter… followed by 3 sons. Naturally they were livid, once old enough to understand, at the law change that robbed them of the Kingdom, but Waldeve’s manoeuvring meant that on his death I would inherit Scotland, Ireland, and the ancestral Dunbar lands and on Valdrade’s death: The Kingdom of England. Waldeve should have settled in then, and lived out the rest of his days as a comfortable king. Any chance of that fled in 1235. As you can see, Aquitaine was no small Kingdom. In fact, the Kings of Aquitaine and France had regularly been at war over territory for the last 200 years – and it would seem the Aquitaine Kings had been winning. It’s true Waldeve had picked up a claim on that Kingdom from one of his ancestors somewhere, but expected this demand to lead to war. A war he hadn’t planned on, but it seemed like a good opportunity. Scotland was stable, and it could be a simple way to add an entire Kingdom to her borders. As it turned out, he needn’t have worried. The King abdicated and just like that, Waldeve was the King of Scotland, Ireland, and now Aquitaine. Of course the nobles that had pushed Waldeve’s claim liked him, but the rest of the French (technically Aquitaine, but I’m going to call them French) Dukes did not like this King with his Scottish mannerisms and they also considered him a foreign conqueror. A few wars were required, but this allowed Waldeve to stripped a couple titles to weaken the more rebellious Dukes, and rearrange the Kingdom somewhat. It wasn’t perfect – short of expelling all the French Dukes and replacing them with Scottish nobles, Aquitaine would always be a struggle to contain. It was hoped eventually they will get used to a Scottish King and come around. He changed the Aquitaine succession laws to elective, and nominated me as his heir. The hope was that I would then inherit the Kingdoms of Scotland, Ireland, and Aquitaine, but the French nobles wouldn’t come to the table. It was looking like on Waldeve’s death Aquitaine would fall to one of their own Dukes. Unable to change the laws a second time, Waldeve simply dissolved the title and Kingdom altogether. What was once the Kingdom of Aquitaine, was now simply more Scotland. The nobles weren’t exactly happy about the development, but Waldeve couldn’t live for much longer, surely. Waldeve, like his father, became known as “the Old”, and eventually passed away on 30 October, 1247, aged 85. Not even from old age, but it was severe stress that got him in the end. My Grandmother (on the other side) also lived to a ripe old age of 87 – so it was some time until I finally inherited England. The succession actually went quite smoothly. 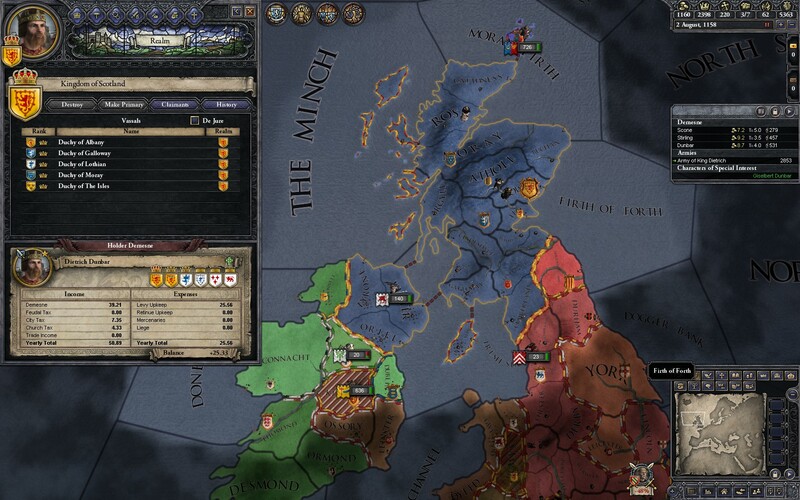 The nobles still weren’t thrilled with having to deal with a Scottish King, but they did not bear a grudge against me, like they had with my Grandfather, for “conquering” them. No, my biggest problem came from my neighbour – the Holy Roman Empire (HRE). A mighty empire, nearly as powerful as Scotland will be – once I inherit England. In the meantime we seem to be well matched. We had terrible trouble trying to stamp out the Lollard heresy here in Scotland. The HRE, meanwhile, had embraced it. This meant that either Kingdom could declare a holy war on the other. 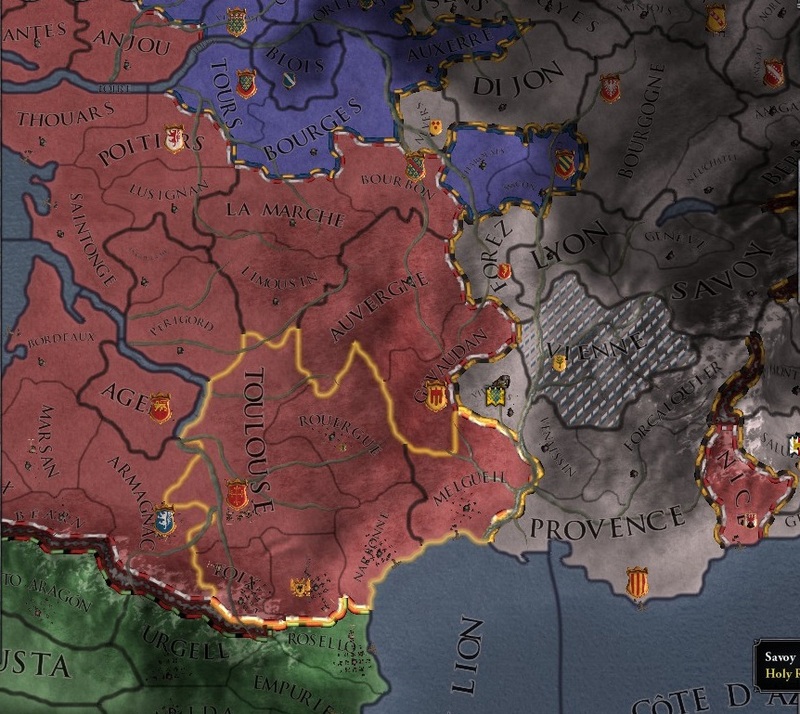 So far we have had 4 – twice a holy war for the Duchy of Toulouse, and twice for the Duchy of Provence. All wars have ended with the defender victorious, so I count us evenly matched. I hope with the English behind me I will finally be able to break this stalemate. In 1264 the Queen of England passed away, and so, finally, a Dunbar sits on the English throne. It also united the Welsh territories, previously split evenly between England and Scotland, under the one banner. 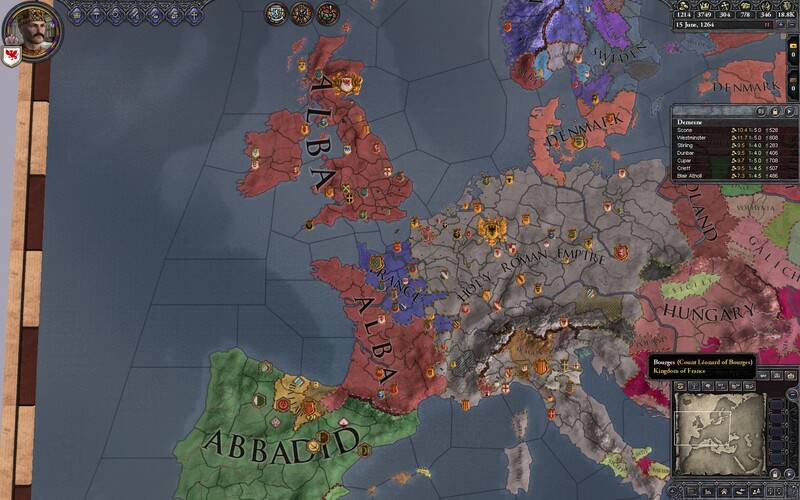 And so, I declared myself Emperor, and my Empire was called Alba. To my east is my great foe: the HRE. I have essentially unlimited casus belli’s to call on them, and could incorporate great swathes of their territory to my own – if only I can beat their armies. The last time we fought, I did so handily and would have pressed my advantage, but with the English crown passing to me I thought I had better deal with the petty in-fighting that the English dukes brought with them first. If I’m lucky I might be able to get the Pope to declare a full invasion of heretic lands, which will allow me to simply invade and keep whatever I occupy. Invasion or no, I can also call on the Knights Templar, the Teutonic Order, and the Knights Hospitaller who can be counted on to fight heretics and non-Christians. 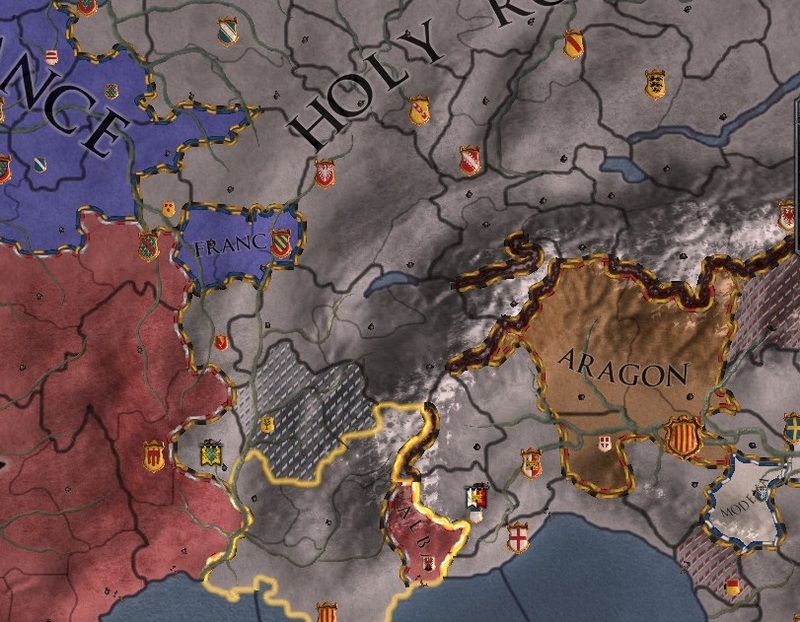 Speaking of non-Christians, to my south and west is the Iberian peninsular. This area has been almost entirely conquerored by the Abbidad Sultantate. Muslim, of course, so again – I can call a Holy War on them at any time. We have no need for “claims” when Europe is in the clutches of non-Christians. Once again, if I’m lucky, I might be able to convince the Pope to declare a crusade on either of these powerful foes. The Dunbar goal has finally been achieved – but perhaps Morgan can push it further than any of my ancestors had ever dreamed. I’m still trying to learn this game, it’s not easy! Yeah it can seem overwhelming. I think once you work out how to find the info you want (like: What titles does this guy have?) You can just play and don’t worry too much about “doing it right.” If you have specific questions (like: How use marriage to get a claim on a title?) you can Google that. The wiki is also a great resource: http://www.ckiiwiki.com/ It just has a large number of “spoilers” that’s all, so you have to pick and choose how much to read. Yes, the whole title thing has been one of my main problems so far. 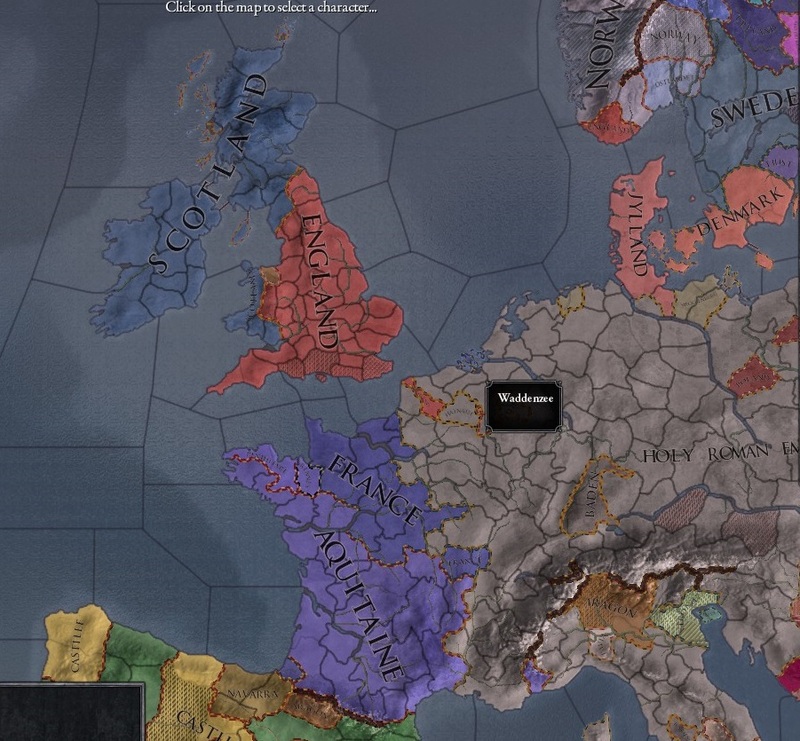 I’ve been playing as the south end of Wales. I’ll definitely check the wiki out!